From the moment you begin planting and through to completion, installing a landscape requires a certain set of skills to accomplish the job efficiently and to stay within budget. Your gardener must be able to access all areas of your outdoor space, schedule the project in such a manner that one stage does not overlap with another, and avoid any unnecessary waste, cleanup or excessive moving of materials. It takes knowledge, experience, and hard work to install a beautiful landscape in Kent, WA. Our gardeners at Lake Washington Landworks have over 20 years of experience doing just that. When you hire us for an installation project, you can rest assured your new lawn will thrive once we are finished. Soil, rock gravel, plants and brush are all a natural part of your landscape, and thus each must be handled properly. For instance, if rock is not moved correctly, it can cause a significant amount of damage to the overall design. A poorly installed landscape can, in turn, create problems rather than solutions in your garden’s drainage and other essential systems. 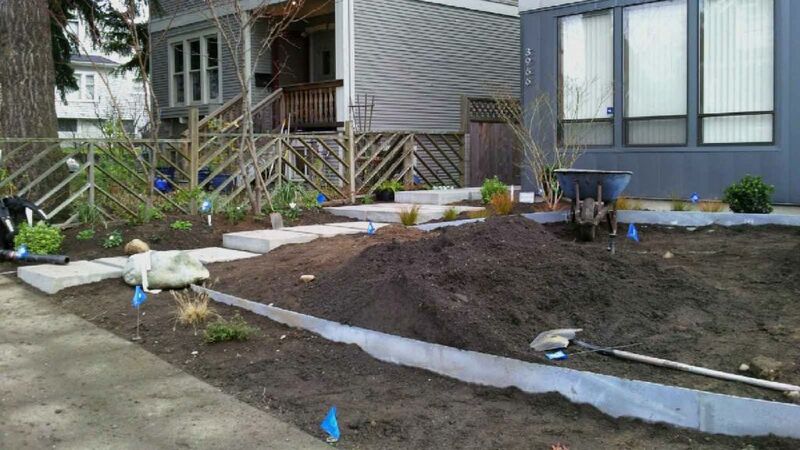 There are many different types of soil in the Northwest area, and our highly skilled experts know the best soil types for your desired landscape. When installing a landscape in Kent, WA, we will make sure that the soil in your yard is a compatible type for the chosen plants. If needed, we will amend the soil to make sure every plant gets the proper nutrition. Every successful landscape needs to have correct plant spacing. The root systems of various plants need a certain amount of space in order to grow. The expert gardeners on our team know exactly how much space each plant needs. No matter what type of specimen we plant, we will make sure it is spaced correctly. Plants need sunlight in order to undergo photosynthesis. While light is necessary for every plant, not all plants need the same amount. As an experienced landscape company in Kent, WA, we know which plants need the most sun and which ones require only a little. We will install every plant in an area where it receives the ideal amount of sunlight all year long. Not every yard provides the right amount of water to your landscape. Both too little and too much water is detrimental to a landscape. That’s why we offer water solutions to make sure your plants get the necessary water they need to live. If we discover your yard is not graded properly to water the plants, we can install a French drain system. We will also place every plant in an area that will be free of flooding. When you think of creating a beautiful garden full of flowers in Puget Sound, Lake Washington Landworks, LLC is your number one choice! We possess extensive experience working in a wide variety of microclimates and difficult terrain across the region. We understand that landscape installation involves soil, water and light conditions and knowing when and when not to amend soil, save water, and perform other related tasks in order to achieve top quality results. We also understand and are able to accommodate the variety of needs exclusive to each individual plant, whether it be the type of soil, water needs, staking and more. When it comes to installing a landscape, no one can provide the same level of service and expertise as our team at Lake Washington Landworks. Come learn why our installation techniques have helped us become a premier landscape company in Kent, WA. We look forward to helping you install a great landscape that will provide you with years of beauty and enjoyment. Our team of gardeners are fully equipped with the required skills and tools to install your landscape in the most efficient and safe manner. We are highly detail-oriented, and we take pride in all that we set out to do. Not only that, but we also ensure that the job site is picture perfect with no mess left behind every time. To learn more about how we can help you plant flowers in Puget Sound for a truly unique landscape, please contact us at Lake Washington Landworks, LLC today.